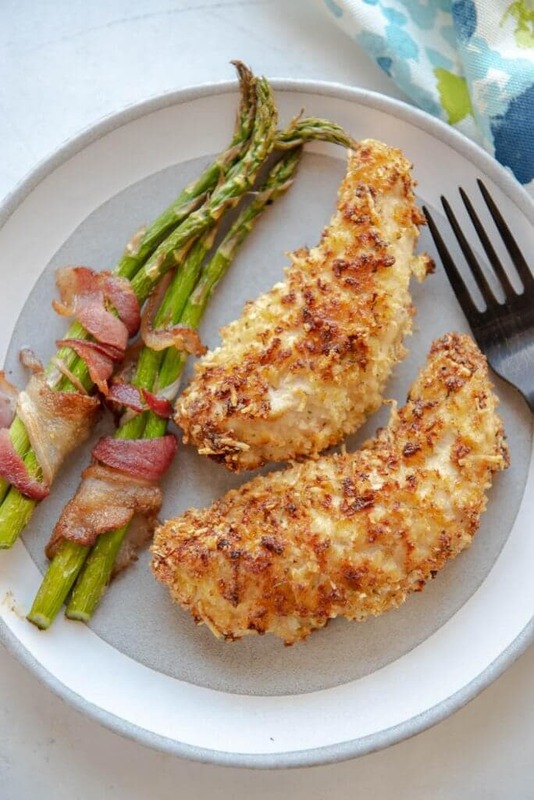 Air Fryer Crispy Chicken Tenders are so easy to make and seasoned with panko and parmesan. 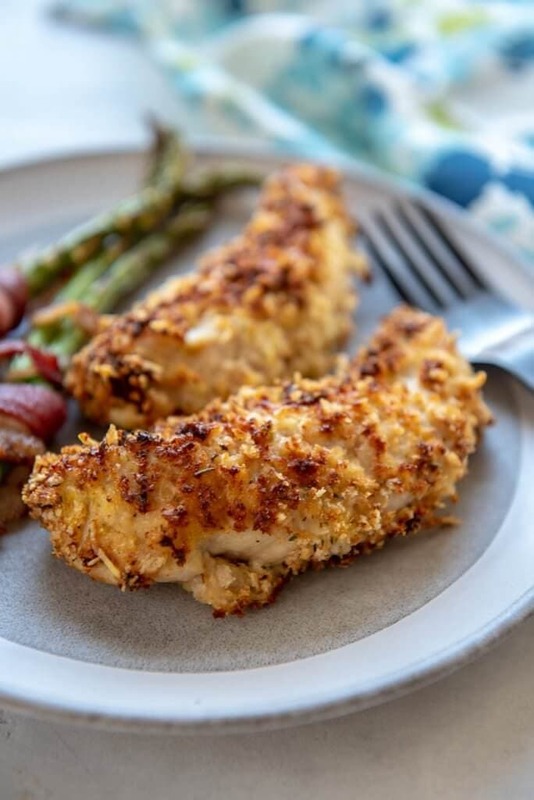 They are so easy and delicious you may never buy frozen chicken tenders again! Chicken tenders are a family favorite at our house. It’s a meal my kids will eat and it’s easy to make, too. My kids have eaten frozen chicken tenders and nuggets their entire lives, but every once in a while Mama likes to make them from scratch. Now that I have created this recipe, these are my new favorite recipe for chicken! And what makes it even better? They are made in the air fryer. Yes. Air fryer chicken tenders. When I first made chicken in the air fryer I wasn’t sure how it would turn out… but I was pleasantly surprised at how much I loved this Air Fryer Southwest Chicken! It is tender and juicy and doesn’t dry out the way it does when I make chicken in the oven. Click here for the air fryer I have. Since we like Air Fryer Chicken Breasts, I couldn’t wait to try Air Fryer Chicken Tenders. When we sat down for dinner my son said, “This is the best chicken you’ve ever made!” If that doesn’t make a Mom’s day I don’t know what will! 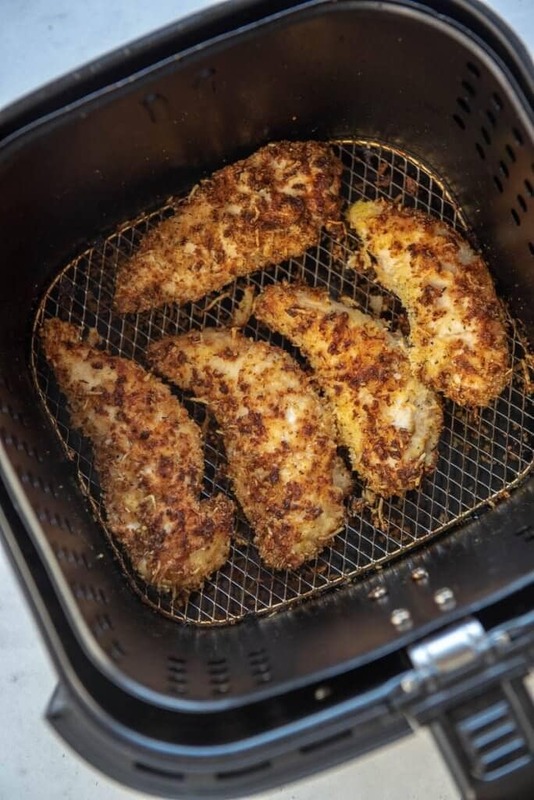 How do you make Air Fryer Chicken Tenders? You’ll need 2 separate dishes. The first dish is for 2 beaten eggs and the second dish is for the dry ingredients. Dip one chicken tender into the beaten eggs. Transfer the chicken tender to the air fryer. What should I serve with chicken tenders? Your options for a well balanced meal with chicken tenders are endless! 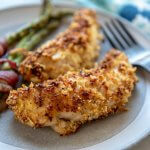 Here are a few ideas of what you can serve with chicken tenders. What is your favorite side dish to serve with chicken? Cooking delicious meals for your family doesn’t need to be challenging and homemade recipes don’t need a ton of ingredients either. I’m all about simplicity, especially now that I have a newborn at home! I don’t have time for a recipe with a million ingredients and has to bake for an hour. Serving my family healthy meals is important, but I also need to be able to get them on the table in a timely manner without a ton of prep. 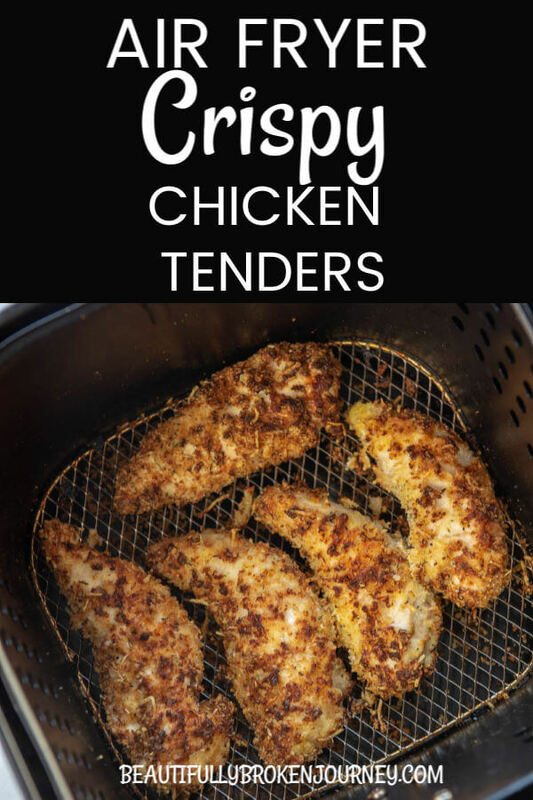 I hope this Air Fryer Crispy Chicken recipe becomes a favorite for your family as well! Beat eggs and put in a shallow dish. 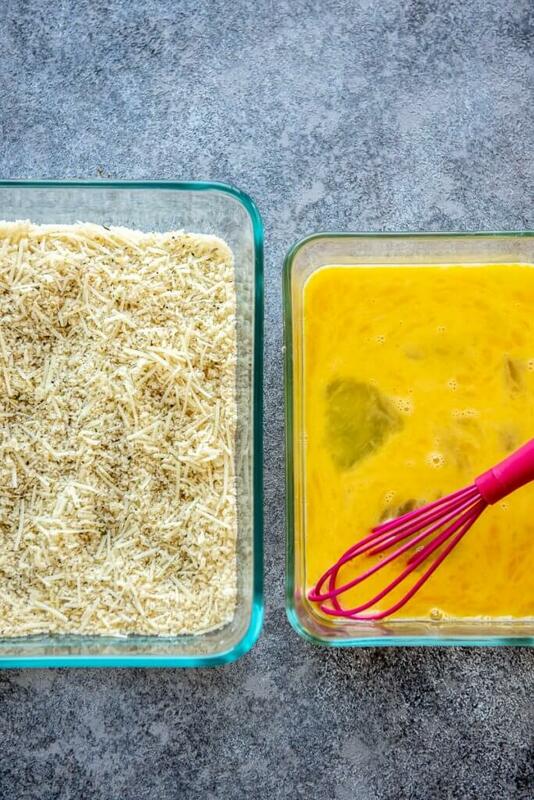 Combine garlic and herb seasoning, cheese and breadcrumbs in a separate dish. Take one chicken tender and dip into egg mixture covering both sides, then transfer to dry ingredients mixture and cover well. Place coated chicken tender into air fryer and repeat with remaining tenders. Bake at 360 degrees for approx 25 minutes, turning halfway through. *Cooking time MAY VARY depending on the size of your tenders. Please use a meat thermometer and cook until internal temp reaches 165 degrees.